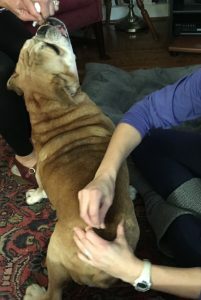 Chopper first presented for acupuncture and rehabilitation therapy on October 25, 2018 due to neurologic problems involving his T3-L3 spinal region as well as some facial nerve paralysis following a Total Ear Canal Ablation (TECA) surgery of his left ear canal. 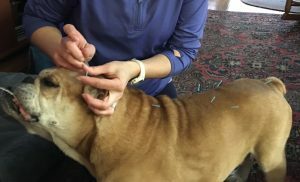 Medical acupuncture, low-level laser therapy (LLLT), and physical therapy techniques were recommended once to twice weekly to rehabilitate the patient. Results showed much improvement of mobility as well as increased functioning of the left side of his face. Drool subsided after the first acupuncture treatment. Below is an outline of the protocol used. 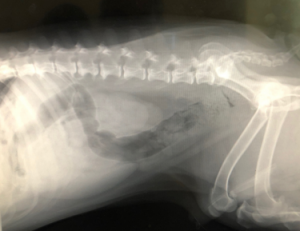 Chopper was an 11 year old neutered male English Bulldog who presented to me on October 25, 2018 for treatment. He was adopted by his current owners four years ago and was neutered at that time. He had a two year history of stumbling on steps and intermittent lameness. Radiographs taken two years ago revealed moderate to severe hip dysplasia bilaterally (Figure 1) as well as a compressive disc space at T12-T13 (Figure 2). He also had a history of chronic ear infections bilaterally with calcified ear canals. The left ear canal was removed with a Total Ear Canal Ablation (TECA) surgery performed one year ago. Following the surgery, Chopper went through a two-week bout of vertigo like symptoms (i.e. reluctant to move or eat and stumbling) and the left side of his face drooped with excessive drool produced from this side. Facial nerve paralysis symptoms continue to be present. Chopper had a body condition score (BCS) of 6/9. He had a very stiff gait in his hind limbs. He neglected to bend his stifles at all and his hind limbs frequently crossed while ambulating. Chopper had a very pronounced head-bob down as the right front limb was placed. His front left limb was placed laterally with most of the weight held on his front right limb. The left side of his face had a slight droop and drool hung from this side of his mouth. The hamstring and quadriceps muscles of bilateral hind limbs were severely atrophied. Crepitus was noted in bilateral stifle joints during passive range of motion (PROM). Myofacial palpation revealed soreness at paraspinal muscles around T7 and from T11-T13. Tenderness of the triceps of the right front limb was noted. Extreme tenderness was noted in the biceps and triceps of the left front limb. Muscle tension was found between the shoulder blades, lateral neck muscles bilaterally, and pectorals. His neurologic exam revealed decreased conscious proprioception and abnormal crossed extensor reflexes of bilateral hind limbs. His sciatic and patellar reflexes were increased bilaterally. The weakness in Chopper’s hind limbs was likely due to neurologic reasons as observed in the physical examination. His crossed extensor reflexes, increased patellar and sciatic reflexes, and decreased conscious proprioception of bilateral hind limbs all indicated that his hind limbs were affected due to an upper motor neuron cause. Because the reflexes of the front limbs were normal, Chopper likely had a lesion in his spinal cord at the level of T3-L3 and it was unlikely caused by a tumor since this had been a problem for an extended period of time. As noted on Figure 2, Chopper had significant narrowing of the disc space at T12-T13. This was likely the location of his disc disease. It would be preferable to have more radiographs done of the spine cranial to this position as well as an MRI to confirm this diagnosis. 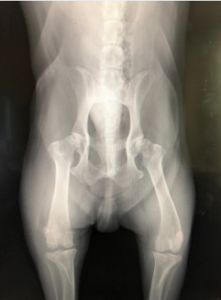 The severe atrophy of Chopper’s hind limb muscles indicated that he was off-loading an excessive amount of weight onto his front limbs in order to ambulate. This overuse of the front limbs and lack of mobility in the hind limbs created the muscle soreness in his biceps and triceps muscles. Myofacial treatment was aimed at relieving pain and tension in the front limbs as well as gaining musculature and mobility of the hind limbs. Tension in the neck, shoulder region, and in the thoracic paraspinal muscles was treated. Neuromodulation was aimed at regaining function to the hind limbs. Another location that was focused on was the facial nerve paralysis on the left side of Chopper’s face. Pain relief was of utmost importance for this patient. I began by discussing weight loss in this patient to help relieve some inflammation on his joints. Daily omega 3 fatty acids were also recommended. Acupuncture (using dry needling Seirin J type 0.20 x 30 mm needles) and photobiomodulation treatments were recommended twice a week until improvement plateaued. A follow-up plan would be set in place at that point. Acupuncture points used for treatment of facial nerve paralysis included SI19, TH21, and GB24. Points were treated on each side of his face due to his history of otitis externa bilaterally. Points closer to his mouth were not used as Chopper had a history of eating things he shouldn’t. Acupuncture points for front limb and shoulder pain included SI 11 as well as cervical spinal nerve points bilaterally. SI 11 is a point along the suprascapular nerve and its treatment helps to decrease myofascial dysfunction locally as well as to treat trigger points in the triceps. Cervical spinal nerve points were treated in order to decrease local pain4. Acupuncture points for tension of the latissimus dorsi muscle in the thoracic region as well as for neurologic dysfunction originating in the spinal region included BL 17, BL 19, BL 20, and BL 21 which were located at points T7, T11, T12, and T13 respectively4. 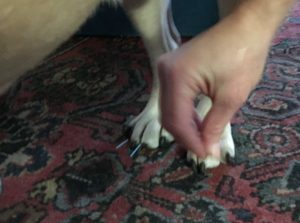 Acupuncture points for hind limb paresis included GB 30, BL 40, and ST36 bilaterally; Bai Hui, and all Bafeng points. The hamstrings are innervated by the sciatic nerve so points focused along this pathway included GB30 and ST 36 (which is at the sight of the Fibular nerve). The ST 36 point was very painful and was not repeated. BL 40 was used for treatment of stifle pain and pelvic limb paresis. All of the Bafeng points were stimulated for their effects on pelvic limb neuropraxia as well as Bai Hui for pelvic limb pain and neurologic dysfunction4. The brachial muscles of bilateral front limbs as well as the thoracic paraspinals from T7-T13 were given laser treatments after the acupuncture treatment was finished. Laser therapy was chosen due to its effects on nociceptive and neuropathic pain1 and for relief due to endogenous opioid release1,2. Laser therapy used in the paraspinal region was primarily for its promotion of nerve recovery3. A Respond Systems Class 3b cold laser was used. A super pulse probe was used to deliver 904 nm wavelength, 3500 pps frequency, and 2 J/cm2 power. The owner was given instructions to perform daily hind limb passive range of motion (PROM) exercises as well as sit to stand exercises for development of hind limb musculature and increased movement of the hind limb joints. Caveletti pole exercises were performed during sessions at 4 inches height to encourage Chopper to lift his hind limbs. Chopper’s bull dog tendencies were very apparent during treatment. He was difficult to treat and did not like to hold still. I adopted a “less is more” approach and began treating him alone with the acupuncture and laser portion of therapy. Some days I got all of the needles in, while other days I had to vary which places were treated due to his incompliance. Also, due to scheduling conflicts, it was difficult to treat Chopper twice weekly. Sometimes he got treatments in once a week while other times it was every other week. A more regular schedule would benefit him greatly. Despite his lack of obedience, Chopper had some notable results. His drooling subsided completely after his first acupuncture treatment due to the facial nerve points used. His owner also stated that he rarely stumbles now when going up the stairs outside. From his first day to his most recent video, his front limb limp decreased slightly and he ambulated more fluidly. He was able to lift his hind limbs to 4 inches in height without hitting the Cavaletti poles as noted in the video from December 8, 2018. This therapeutic exercise will be continued regularly to help encourage bending of his stifles. His improved ambulation was likely due to a combination of acupuncture and laser treatments as both were used in treating his limbs and back. His final video showed his hind limbs continuing to move stiffly with very little bending of his stifles. As a result of Chopper’s therapy sessions, I have learned first-hand about the ability of nerves to recover from neurologic injury. Both his facial nerve and his hind limb nerve results showed improvement after treatment. Although his therapy is not over, he continues to improve. Further research involving acupuncture’s ability to recover nerves would be of great benefit to this patient and others recovering from neurologic injury. 1. Cotler, Howard B, Chow, Roberta T, et al. The Use of Low Level Laser Therapy (LLLT) for Musculoskeletal Pain. PMC. 2016. 2. Hagiwara S, Iwasaka H, Okuda K, et al. GaAlAs (830 nm) low-level laser enhances peripheral endogenous opioid analgesia in rats. Lasers in Surgery and Medicine. 2007;39. 3. Millis, Darryl L. & Levine, David. Canine Rehabilitation and Physical Therapy Second Edition. Philadelphia, PA: Elsevier, 2014. 4. Robinson, Narda G. Curacore Canine Point Mini-Manual. 2017.